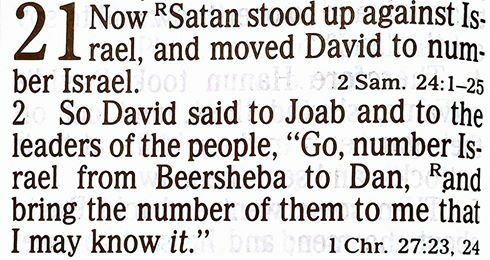 The devil will tempt a man to count and number and measure and then to boast in strength do that he did not trust in God. me a thorn, so that I glory in what you do. David had a great heart for God. But even such a man can give in to temptation. I know this very well and so this morning I look to God. “Therefore humble yourselves under the mighty hand of God, that He may exalt you I’m due time, casting all your care upon Him, for He cares for you. Be sober, be vigilant; because your adversary the devil walks about like a roaring lion, seeking whom he may devour. Resist him steadfast in your faith, knowing that the same sufferings are experienced by your brotherhood in the world.” 1 Peter 5:6-9. At the end of David’s life in 1 Chronicles 28-29, we see a very spiritual old man in David. He reminds Solomon to be faithful and he praises God, saying, “Yours, O LORD, is the greatness, the power and the glory, the victory and the majesty, for all that is in heaven and in earth is Yours; Yours is the kingdom, O LORD, and You are exalted as head over all.” 1 Chronicles 29:11. The proud can be tempted to trust in the flesh. But men can also learn and turn back to God. The believer trust in the strength of God. Stay humble and tell the devil to go away. Text in graphic is 1 Chronicles 21.